While majority of Americans are recovering from a long holiday weekend and gearing up for the week ahead, DJ Khaled is making it clear he isn't done giving thanks just yet. Today (Nov. 26) marks the beloved DJ's birthday, with Khaled commemorating the special milestone with a heartfelt message expressing his gratitude for his fans and thanking God for his blessings. Naturally, the excitable message had to be penned in all caps, with Khaled writing, "It's my B DAY !!!!!!!!!!! GOD IS THE GREATEST!! THANK YOU GOD FOR MY SON ! MY FAMLIY ! FRIENDS ! AND MY TEAM ! MY FAN LUV!!! GOD IM SO GRATEFUL FOR YOU ! IM AM SO BLESSED ! GOD I LOVE YOU ! THANK YOU !!! #GRATEFUL I WILl NEVER STOP!!!!!!!! LETS WIN MORE ! MORE BLESSINGS !! ALL PRAISE THE MOST HIGH! #WeTheBest." 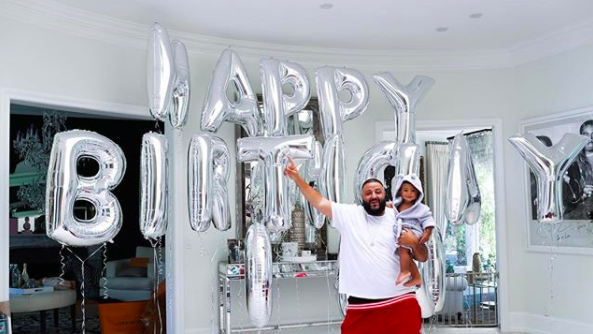 DJ Khaled often turns to social media to show love to his fans, friends and to God, with today's birthday message furthering the tradition and practice of gratitude. He later added that all of his "fan luv" was making him tear up, sharing a photo of him and his adorable baby boy, Asahd. Talk about a #TeamLOVE moment! Happy birthday, DJ Khaled! Take a look at his passionate messages below. ITS MY B DAY🎉🎉🎉 !!!!!!!! GOD IS THE GREATEST!!!!!!!!!! 🙏🏽🔑 ALL THIS LUV IS MAKING A ME TEAR UP!!!!! YOUNG 👑s ! !